It’s Movember, Beards of Denver faithful, and to kick it off right we bring you a magnificent, yet modest, mustache! Meet Macon, who has been growing his stellar ‘stache for over two years. Originally from Houston, Macon’s been a Coloradoan since 2001 and a Denverite since 2007. He told us the best part of sporting his ‘stache is that people buy him drinks all the time, and the worst part is that everyone wants to talk about it (guilty as charged) particularly bros, kids, and cougars (why are we not surprised about the cougars? Look at that face!) In fact, Macon’s been beckoned by cougars who asked him if mustache rides are free. Ladies, take note: Please buy the gentleman a drink first! While most people admire his mustache, occasionally bros are aggressive; he even got called out on the 16th Street mall recently. Obviously, that person needed to feel the ‘stache love! Speaking of love, Macon said his sweethearts are a fan of his ‘stache, and are always surprised at how soft it is, which may be due to the fact he waxes it almost everyday with mustache wax a friend gave him called Mr. Mustard’s Magnificent Magical Mustache Manicuring Miracle Wax (say that five times fast), which he keeps in his pocket right next to his Altoids. We love that dedication to the ‘stache. Macon’s mom and sis like his ‘stache more than when he had his beard, as they want to see those gorgeous cheekbones! Understandable, ladies. Macon told us when he rocked his beard it was really wiry, but he figured it was a good way to find a great lady: If a girl loved him with his big, wiry, ridiculous beard she must really love him. We’re just glad at least the ‘stache lives on. Besides growing that superb ‘stache, Macon is a professional musician, playing upright bass and guitar in a few bands in town, including the wonderful band Paper Bird (who we’re big fans of here at Beards of Denver). Additionally, he just started a record label, Collectible Records, which had its first release the end of September. He also dabbles in landscaping, carpentry, and soon pedi-cabbing. We predict people will be lining up to get a pedi-cab ride from this ‘stache! If you see Macon around, perhaps just give him a knowing nod of appreciation; he likes that his ‘stache is well-received but doesn’t always need to talk about it. Duly noted, and most appreciated. Thanks Macon! We love hump day for a variety of reasons; camels are amazing, ‘The Humpty Dance’ is set on repeat in my office from 12-1 every Wednesday, Whiskey Bar has some sweet specials and we typically have a fantastic beard to share. Meet Randy. Randy Whitsmill. A big thank you to his fellow co-worker and avid BofD supporter (and guest), Androo—without you, this glamorous beard wouldn’t have gotten the recognition it so deserves. (3:42:47 PM) Androo: what does your mother think about it? (3:44:57 PM) Androo: do you agree with mom? (3:46:22 PM) Androo: moderating that a bit helps you go out to lunch without attracting a crowd, I’d imagine. (3:47:08 PM) Androo: and after that? (3:47:44 PM) Androo: and you’re now a vegetarian? (3:48:27 PM) Androo: how long have you lived in CO? (3:51:56 PM) Androo: has having facial hair helped in any surprising ways in your life? (4:04:50 PM) Randy: Personally – people look at me and sometimes laugh. They think I must be funny. But that’s not really the case. Professionally – I would really attribute all of my success thus far to my appearance. It’d be a shame should I interview with someone who is blind. (4:06:20 PM) Androo: any particular grooming practices? (4:07:22 PM) Randy: Grooming? I’m not sure what you mean. This is just how my beard grows naturally. (4:10:02 PM) Randy: Don’t ever let anyone tell you you shouldn’t grow out your beard because it’s too spotty. That’s just your body being creative. A few weeks ago, Beards of Denver ventured down to Texas. And when not searching for Willie Nelson and admitting that, yes, everything is bigger there, we were fortunate enough to enjoy some whiskies on a raucous Saturday night while a country band played at Adair’s Saloon in Dallas, and happened upon our latest Guest ‘Stache: Rhett. Rhett, who’s had his ‘stache in this amazing condition for the past three years, is Fort Worth born and raised and now lives in Dallas, but, interestingly enough, had a Colorado connection of a friend’s band touring in Denver the same weekend we met him; we thus loved he and his stellar ‘stache even more. Rhett originally decided to grow out his ‘stache to battle a buddy who was also growing out his beard, and Rhett had–he said, regrettably–recently trimmed up his ‘stache. We still thought it more than impressive, and weren’t surprised to learn he’s a hair stylist by trade; that ‘stache ain’t from just any amateur. Pleased to meet you, cowboy! Beards of Denver fans, Meet Dan and his sweetheart Christy, and feast your eyes on Dan’s fantastic, artistic ‘stache! Christy created this ‘stache masterpiece from Dan’s formerly full beard; apparently, Dan felt he needed a fun change and Christy was able to play Picasso—and—viola!—the masterpiece emerged! The Handlebeard was a smash hit at Dan’s work Christmas party with his co-workers AND his boss, but proved a bit high maintenance. After about a week of gaining adoration from strangers (in restaurants and public transit) and family alike, Dan, a Missouri native, who has been in Denver about seven years, decided to shave it off and bring the full beard back to its glory. Christy, originally from Illinois, has called Denver home for just over two years. She said she had never known too many guys with beards until landing in the Mile High City. Her favorite part is the fuzziness—the middle-to-end stage when the beard softens up, and she thinks most women would agree with her on that (I know we do!) One thing Christy does caution about is the “stubble burn” that bearded men might leave on their significant others’ cheeks when they start to grow their beards back out; early on, the glorious beard may feel like sandpaper, and when kissing their sweetheart and then rubbing their cheek, the beard, in its infancy, can leave a mark. We say it’s all worth it though for such handsome specimen! Thanks guys—we can’t wait to see what creation is next! We found this extra special Imperial stache pouring some delicious ESB beer brewed by your very own Denver Beer Co last Sunday night. 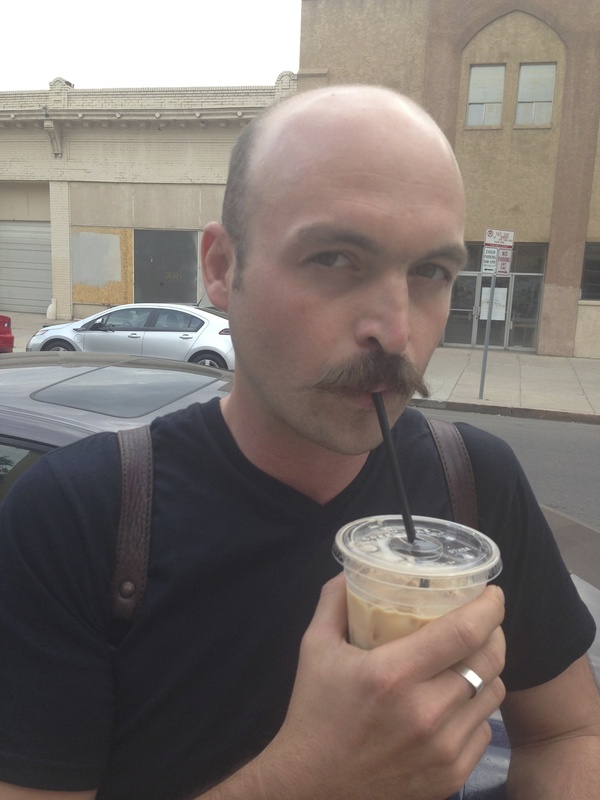 Nick’s mustache needed to be celebrated, so he’s our honorary guest stache of the month. Nick left the treacherous terrain of Illinois several years back. It was on his journey west that he decided to let the stache do as it pleased, and we thank him for it every day. Nick is currently in the process of becoming even more distinguished; he will soon be a cicerone. Nick, we’re pretty sure you can just show up for the test, give them a peak at your upper lip, and the title is yours. Do yourself a favor, head on over to the DBC, order a beer or seven (and a jumbo pretzel) and let Nick fill your curious brain with all you’ll ever need to know about brews and what mustache wax to buy.